Dividend investing offers some of the best financial opportunities for new and seasoned investors alike. The proof is in the numbers: according to economic data from 1927 to 2014, growth rates for dividend-paying stocks (10.4%) substantially outperformed non dividend paying stocks (8.5%). If you typically invest in non dividend paying stocks, then you could be missing out on a lucrative opportunity to boost your long-term portfolio growth, in addition to the short-term income potential presented by stocks that pay dividends to shareholders on a quarterly or monthly basis. Simply put, dividends are the portions of a company’s earnings that are paid out to shareholders. The company’s board of directors ultimately dictates the dividend amount, which may come in the form of cash or stock shares. Whereas other types of investments that simply fluctuate in value until you choose to sell, a stock that pays dividends not only grows in value (hopefully!) but also pays out a small sum to shareholders on a regular basis. This alone makes dividend-paying stocks vital components of any successful investing strategy. Dividend stocks are those that pay out dividends to shareholders on a regular basis (typically on a quarterly or monthly basis). When it comes to dividend investing, you’ll want to choose stocks that offer favorable dividend yields (annual dividends per share divided by the price per share). Dividends can increase or decrease over time, depending on the company’s performance and other related factors. For reference, the average dividend yield for the S&P 500 is 1.83% (as of May 2018). Rather than choosing stocks that currently have high dividend yields, a smarter dividend investing strategy would be to analyze the historical dividend growth rate. This way, you’ll be more likely to invest with a company that has a proven track record of consistency with its shareholders, instead of a company that just so happens to be having a great year but didn’t pay its shareholders great dividends in the past. Additionally, you might want to invest in “qualified” dividend stocks, that come from companies with typical structures ( not REITS & MLP) which must be held for at least 60 days and result in lower tax rates on your dividend income. 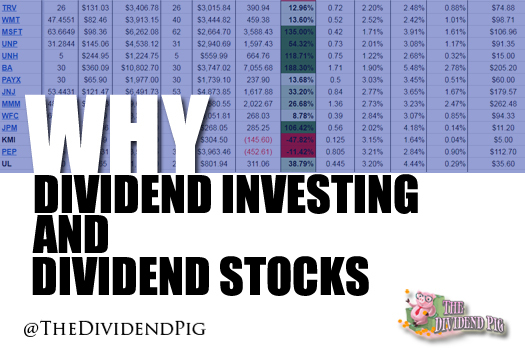 How Does Dividend Investing Work? To build a dividend portfolio, there are multiple aspects of dividend investing to understand before you start pouring money into dividend stocks. For starters, you’ll want to consider which of the two main strategies you want to focus on: high dividend growth rate or high dividend yields. The dividend growth rate approach emphasizes long-term benefits by investing in fast-growing companies that presently pay out low dividends, while the high dividend yield approach emphasizes short-term benefits by investing in slow-growing companies with quite a bit of cash to pay out to shareholders. Before deciding which approach is right for your portfolio, it’s crucial that you understand the concept of a dividend payout ratio, which is the percentage of company earnings paid out to shareholders in the form of dividends. This ratio is useful for investors because it helps them compare how much money the company reserves for growth versus how much money the company distributes to shareholders. For instance, a tech company that pays tiny dividends to preserve a majority of its earnings for rapid expansion would be a good choice for an investor who favors the dividend growth rate approach, while a well-established company paying decent dividends that have consistently increased over the last several years would be ideal for an investor who favors the high dividend yield approach. One of the best ways to maximize returns with a dividend investing strategy is putting your money into dividend reinvestment plans (DRIPs). These plans allow investors to easily reinvest cash dividends into additional shares (or fractional shares) of company stock on each dividend payout date. More than 650 corporations currently offer DRIPs because these plans are advantageous for companies and investors alike: companies receive more cash to grow and investors receive greater opportunities for returns through stocks over cash payouts. Is Dividend Investing Ideal for Your Portfolio? Dividend investing is typically viewed as more of a conservative investment strategy because returns are more consistent and the stocks tend to perform better over time. Without dividend-paying stocks in your portfolio, you could be missing out on a great passive income opportunity, not to mention other opportunities to reinvest those dividend payouts back into the company through DRIPs. For more information on dividend investing, visit my dividend 101 page. Also, visit my resources page for some great personal finance book recommendations.